It was going to be a tough day as far as results were concerned for the Crested Butte Titans track team at the Frank Woodburn Invitational at Stoker Stadium in Grand Junction. 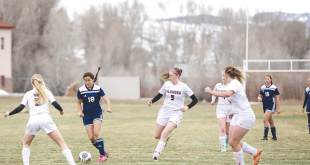 The event, which took place Saturday, April 4, draws most of the top programs from the Western Slope, and while that keeps Titans off the podium and low in the overall team standings, it also provides an opportunity for them to bring their game up a notch. The Titans rose to the challenge and while a top-three finish eluded them in all events they competed, they did make notable progress in their respective events. “We had 13 personal records over the weekend. 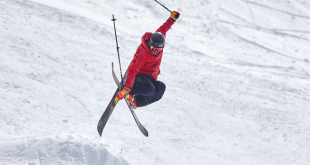 Across the board all of the kids are getting faster and stronger,” says Simoens. In his continuing search to find the right mix of runners for relays, Simoens put together a new line-up of Joe Hayes, Woody Martineau, Aiden and Conrad Truettner for the boys 4×800-meter race. The four runners lined up in the most competitive heat and used the breakneck pace of their competition to spurn them on to a fourth place finish posting a time that has them ranked fifth in the state among 2A schools. “They’re all ranked pretty high, and if we can hold onto those positions we might send every relay team to state,” says Simoens. The 4×200-meter relay team of Erika Bremer, Tara Mortell, Malia Olson and Jamey Spahn had the top showing in Grand Junction for the girls team, placing fourth in their event. Sam Crossett and Sydney Petersen continued to feed off of each other, shedding additional time off of their mile times in Grand Junction. Petersen went on to charge her way through the pack in the two-mile race as well, finishing the day with a sixth place in the mile and a fourth place in the two-mile. “Both Sydney and Sam brought their A game,” says Simoens. Aiden continues to bring strength to the boys team in the distance events, also placing fourth in the two-mile. “The kids responded and I think, overall, it was a really good meet,” says Simoens. Unfortunately, just as the Titans are starting to hit their groove and shave time across the board in all events, they will hit April break at the school next week. As a result, Simoens and the other coaches will do what they can to keep the team moving forward as they hit the road for family vacations. For those who are staying in the valley for the break, Simoens has the team scheduled to compete in a meet at Western State Colorado University on Saturday, April 18. “That’s a really cool meet because it’s a combined meet with Western and the kids get to see the collegiate athletes and see the next level of track,” says Simoens. Once back in school, the Titans will jump immediately back into the fray with a freshman/sophomore meet in Gunnison on Wednesday, April 22 and a full squad meet in Montrose that Friday.